A few months ago, AMD launched and termed their latest Radeon R9 Fury X as a great 4K gaming card and a beastly overclocker, designed top-to-bottom to meet the needs of enthusiasts. 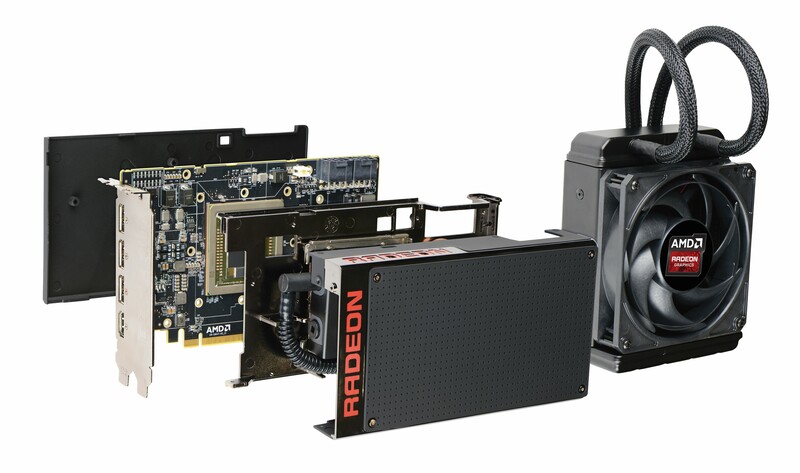 The Radeon R9 Fury X became the first card to feature a full water cooled design as a part of its reference design. AMD also made it the first card to incorporate HBM (High-Bandwidth Memory). The report we are covering day is posted by TechPowerUp in an exclusive voltage scaling article performed on the Radeon R9 Fury X graphics card. When AMD launched the Radeon R9 Fury X, they claimed that it was going to be a dream card for overclockers and featured a PCB with 600 Amps of power delivery. During launch, we actually got to learn that the Radeon R9 Fury X was not a great overclocker at launch and that was mostly due to non-existent overclocking software support. The only overclocking support on the card was GPU base clock frequency adjustment which pushed the card around 50-80 MHz higher than its reference 1050 MHz core clock which meant an overall boost up to 1130 MHz (given you got hands on a really good sample). Aside from the GPU core, the HBM memory was clockable up to 560 MHz, which was surprisingly unlocked in MSI afterburner with a bug. The HBM slider has since been officially unlocked in overclocking utilities and does allow overclocking. But after a certain point, HBM memory becomes unstable and starts making artifacts that ruin the overall experience that occur at random when the memory is under load. Since the GPU is not under any bottleneck by the memory, there are limited gains with HBM overclock when it comes to overall gaming performance so it kind of becomes pointless to overclock the memory. Unlike GDDR5 which is definitely old but not yet outdated tech, HBM1 featured on Fiji is relatively new and will take time to be more effective under over clocks as its becomes a standard technology overall several variations of graphics cards. Voltage control was a feature that was expected to come to Fiji GPUs and TechPowerUp has put a very detailed summary of why it took so long for the R9 Fury X to get software based voltage control after a month of its launch. Unlike NVIDIA, AMD does not provide good API support to developers, their ADL library is outdated and buggy, with updates spaced years apart. So most software utility developers implement hardware access directly in hardware, writing directly to the GPU registers, which AMD is changing around with every new GPU. AMD’s developer support is pretty much non-existent these days. With recent GPU generations, AMD has transitioned GPU management tasks away from the driver, onto a little micro-controller inside the GPU called SMC, which is handling jobs like clock control, power control and voltage control. On Fiji, this controller adjusts and monitors voltage dynamically, which helps with overall power consumption. However, it makes voltage control more difficult than before. When overriding voltage externally, the controller will sense a discrepancy between its target voltage and real voltage, and assume a fault has occurred, so it sends the GPU into its lowest clock state: 300 MHz. The voltage monitoring process also keeps the I2C bus very busy, which causes interference with other transactions. If two of these transactions overlap, the result data will be intermixed or faulty, which will cause the SMC to sense another possible fault, this time turning off the screen and setting fan speed to 100%, to avoid damage to the card. With Voltage control finally cracked for Fury X, TPU puts their sample to the tests and what has been shown isn’t the same as what AMD told to consumers a month back. The max clock which is obtained with a +144mV is 1215 MHz. This is a 165 MHz clock improvement over the reference 1050 MHz clock speed but the actual performance difference within Battlefield 3, which is a game specifically optimized for NVIDIA hardware shows just a 4 FPS increase from 55 FPS to 59 FPS. The +144mV voltage controller stepping means a 1.35V for the GPU which gives the maximum stable frequency for the card. Anything above that will make the card unstable and down clock it. While the GPU temperatures increase from 67C to 71C thanks to the liquid cooler, the VRMs on the other hand have temperatures of 95C which even the copper pipe that is situated over them to dissipate heat can’t effectively handle well. Overall, for just a 5% increase in performance with overclocking, you can witness the power draw go up from 420W on stock usage up to 600W with overclocked frequencies and voltage adjustments. This does show that the card is not as effectively a great clocker as it was marketed as. The competition on the other hand is busy breaking overclocking numbers with great custom cards and performance that is faster than dual chip cards with the same price as Fury X.